Kanem Borno Human Development Association (KABHUDA) has been part of the Nigerian National Tuberculosis Network for a while. As part of expanding the frontiers of collaboration, the network engaged KABHUDA in July, 2017 as the implementer of the MDR TB project in Yobe state. Consequently, the NGO has 15 patients under its care, oversees their drug therapy needs, monitors their treatment progress, and noting and reporting complications that may arise in the course of the treatment regime. Most of these activities are executed through the active participation of 15 patient supporters and the local government TB officers. 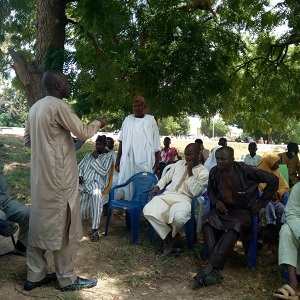 As part of efforts to strengthen the operational capacity of the patient supporters, a training was organized in favour of the patient supporters in Damaturu, the capital of Yobe state. in September 2017 where TB experts facilitated the training session on how to best manage TB patients receiving MDR treatments. The patients, the patient supporters and the LGA TB officers all have been placed on a monthly allowance to facilitate effective service delivery. The project has three (3) program officers and a program coordinator in the person of Dr Aliyu Daja. 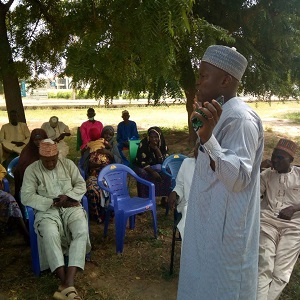 The project also holds a monthly group meeting with the patients, patient supporters, and the LGA TB officers at the Damaturu office of KABHUDA in order to monitor the status of patients and to give the patients the opportunity to give feedback. As part of community mobilization, there is a quarterly community social mobilization where a community is sensitized on the MDR TB disease .The program officers also conduct visits on a monthly basis to the patients to check on their progress. Having successfully delivered on all project deliverables, this project was closed in December, 2018.